The crapemyrtle aphid, Sarucallis (Tinocallis) kahawaluokalani, is one of the most common pests of crapemyrtles. It was originally described from crapemyrtle in Hawaii and named for the queen, Kahawaluokalani! Crapemyrtle aphids are small, fragile insects around 1⁄16 inch long. They are pale yellowish-green with black spots on the abdomen. Crapemyrtle aphids are easy to distinguish from other aphids that occasionally infest crapemyrtle. Winged adults have dark tipped antennae and two double-pronged humps on the back. Crapemyrtle aphids nymphs resemble wingless adults, but are smaller. Older nymphs have black spikes on the abdomen. Feeding by crapemyrtle aphids may reduce plant vigor and cause leaves to distort slightly as they develop. Heavy infestations detract from the aesthetics of nursery and landscape plants due to yellowing of the leaves, premature leaf drop, and black sooty mold that results from honeydew production. Crapemyrtle aphids overwinter in the egg stage. The eggs hatch in April, and for the rest of the growing season crapemyrtle aphids give birth to living young. The young aphids mature in about 10 days. As such, there are many generations per year. Both winged and wingless aphids are born during the growing season. Winged forms migrate to start new colonies only on crapemyrtles. The last generation of females lay eggs that overwinter. Crapemyrtle aphids are monophagous, meaning they only feed on one plant species and thus will not move from crapemyrtle to other plants in the landscape or nursery. Crapemyrtle aphids feed by inserting slender mouthparts into leaves and sucking out sap that is rich in sugars. As they feed, aphids also inject saliva. This saliva causes pale yellow spots on the leaves. Since aphids consume large quantities of plant sap, they excrete sweet, sticky liquid called honeydew. When aphid numbers are large, honeydew often completely coats leaves and other objects below, giving infested plants a sticky or varnished appearance. Honeydew attracts ants, flies, wasps and other insects. Black, unsightly fungi called sooty mold often develops in honeydew, causing the plants to be less attractive. Crapemyrtle aphids lay their eggs along the flanges of crapemyrtle twigs. Crapemyrtle aphids are easy to distinguish from other aphids that occasionally infest crapemyrtle. Winged adults have dark tipped antennae and two double-pronged humps on the back. Crapemyrtle aphids nymphs resemble wingless adults, but are smaller and have black spikes on their abdomen. 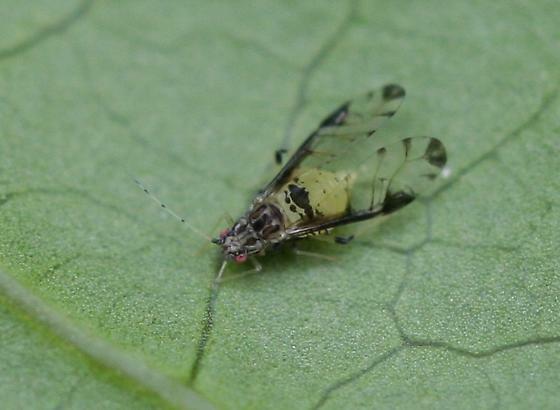 Begin monitoring for crapemyrtle aphids in early May. Aphids can be located by standing below the tree and looking up at the underside of the leaves. Aphids will appear as small black specks. Closer inspection with a magnifying glass can confirm the identification. Larger infestations can be recognized by yellowing leaves and the presence of shiny, sticky honeydew or sooty mold on the leaves. Dark cotton aphids infesting crapemyrtle leaves. Crapemyrtle bark scales on a crapemyrtle twig. Crapemyrtle aphids (like most aphids) reproduce rapidly and have the potential to reach damaging levels very quickly. On the other hand, many infestations are kept below noticeable or damaging levels by natural enemies such as lady beetles and green lacewings. Control by natural enemies may be more likely in landscape settings than in production settings where plants are grown in monoculture. In addition, small aphid populations are less likely to be noticed in established landscapes than in retail or wholesale situations where plants undergo more careful scrutiny. Therefore the decision of when or whether to treat cannot be boiled down to a simple threshold or formula. If natural enemies are not able to keep crapemyrtle aphid populations below acceptable levels, then chemical control may be desired. Table 1 lists some of the products used to control aphids that will not harm natural enemies as much as pesticides containing a pyrethroid (e.g. permethrin, bifenthrin), organophosphate (e.g. Orthene), or carbamate (e.g. Sevin). Horticultural oils can also be applied as an early dormant spray post leafdrop. Repeat application when needed as aphids reappear. Another intervention method is to plant less susceptible varieties of crapemyrtle. Table 1. Some insecticides labeled for aphids in ornamental systems considered compatible with beneficial insects. * Suitable for homeowner use. Conserving beneficial insects is not just an environmentally responsible thing to do. It can improve control of pests such as aphids. Remember, an insecticide application will never kill every individual of a pest population. It is the job of natural enemies to clean up after and between insecticide applications. Otherwise, a few aphids that escape an insecticide application can rapidly reach damaging levels. Natural enemies of crapemyrtle aphids include lady beetles and their larvae, green lacewings and their larvae, hover fly maggots, parasitic wasps, and entomophagous fungi. Pay attention to the presence of these natural enemies when scouting and you may be able to skip an insecticide application. 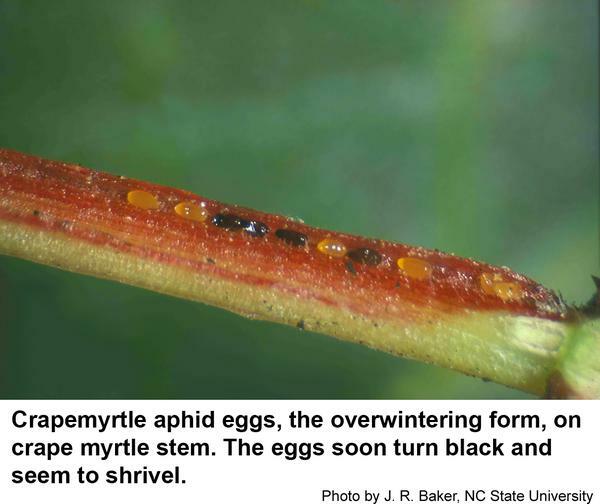 Aphids on Ornamental Plants, Entomology Insect Notes. Frank, S. D. 2009. Common name: crapemyrtle aphid, scientific name: Sarucallis kahawaluokalani (Kirkaldy) (Insecta: Hemiptera: Aphididae). Herbert, J. and R. F. Mizell III. 2013 (revised). . Featured Creatures. Entomology & Nematology, FDACS/DPI, EDIS. 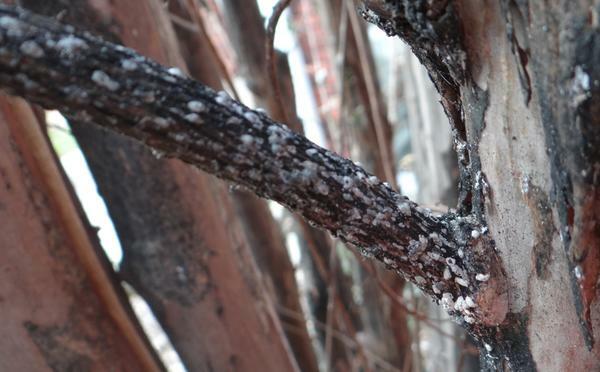 Crape Myrtle Diseases & Insect Pests. Doubrava, N., J. M. Scott, J. H. Blake, and G. S Gorsuch. 1999 (rev. J. Williamson. 2014). Clemson Cooperative Extension, Home and Garden, HGIC 2002. Host Preference of the Crapemyrtle Aphid (Hemiptera: Aphididae) and Host Suitability of Crapemyrtle Cultivars. 2009. Authors: Herbert, J., R. F. Mizell, and H. J. McAuslane. Environmental Entomology, Volume 38, Number 4, August 2009 , pp. 1155-1160(6). Suitability of ‘Natchez’ vs. ‘Carolina Beauty’ Crapemyrtle Cultivars as Hosts for the Crapemyrtle Aphid. Alverson, D. R. and R. K. Allen. 1992. SNA Research Conference 37: 160-162.